Here's the nearly-completed top draped over a lawn chair! The colors really pop in the bright sunshine. I hadn't added the border yet when I took this photo. From a distance, it's difficult to tell that this project began with strips of not-so-square squares sewn together with a disappearing quarter-inch seam. So far, I'm pleased with my effort of turning quilty lemons into lemonade. 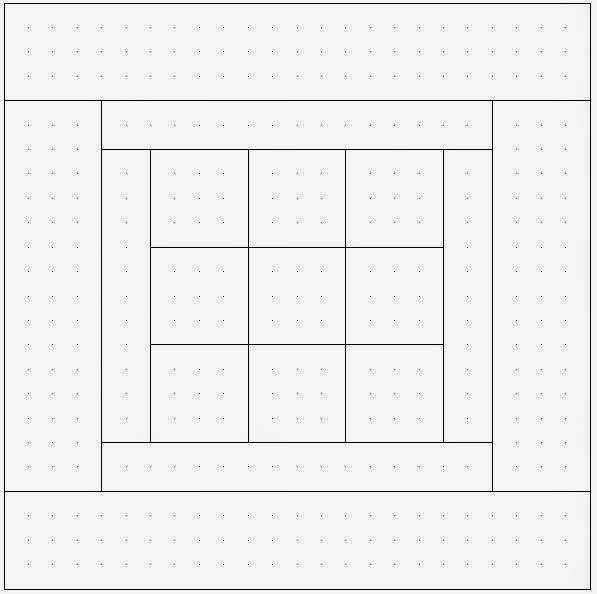 Here's a schematic of the block design those 9-patches developed into. Perhaps 9-Patch in the Courthouse would be an appropriate name for it. My next step is to sandwich the top with batting and backing. Since this is the type of quilt that only gets used one or two months a year, I'm not going to put a lot of expense into this part. I have a fleece throw that I purchased on sale last December that's just about perfect for the back: red with large green and white dots. And I already have a small size poly batting on hand. Once sandwiched, I'll have to decide on how to hold the layers together. I don't like machine quilting with fleece backings, so I've already discarded that option. The two options I'm debating are 1) tie it with yarn, or 2) hand quilt it with embroidery floss using the big stitch method. Both seem appropriate for a quilt in the crooked man's crooked little house! 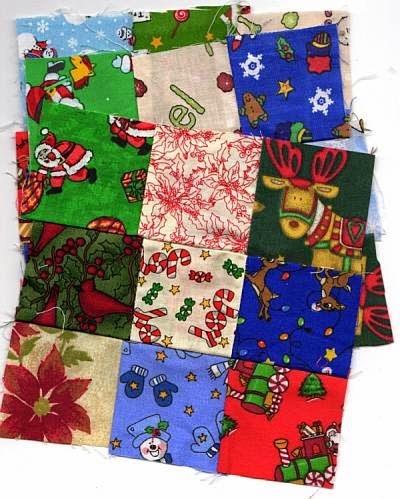 When it comes to sewing blocks together, we quilters seem to have only two options: we can sew the blocks together, side by side, or we can sew strips of fabric called sash or sashing between the blocks. Sometimes I wish there were more options, but every time I think I've found a new one it turns out to be a variation of sashed or not sashed. For this project, I deliberated both options. My go-to method for most projects is to use sashing between the blocks unless assembling the blocks without sashing creates a new design effect, as when Snowball blocks and 9-Patch blocks are sewn together. In this case, sewing the blocks without sash would have created colorful 9-patches floating in a sea of white -- not the effect that I wanted. A red or green or even blue sash would have disrupted the white sea, but I was concerned that the constant size of the sashing strips would emphasize the irregular size of the white framing strips. 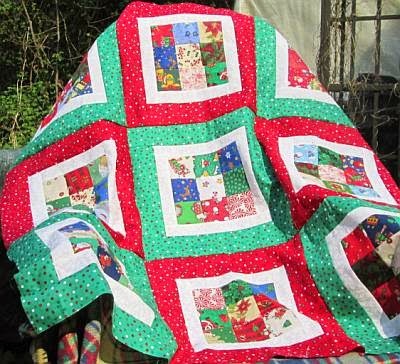 I know I named this The Crooked Man's Christmas Quilt, but I really didn't want to emphasize the irregularities! So, I decided to add another round of framing strips in the style of the Courthouse Steps block. 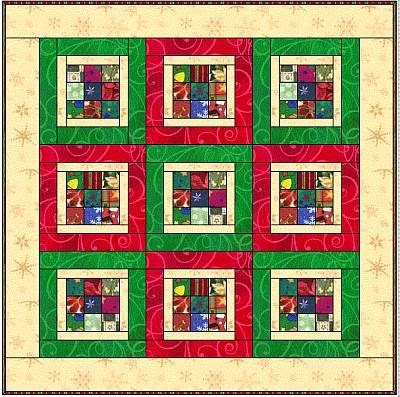 To distract the eye from comparing the irregularities in the blocks, I framed four of the blocks with red fabric and five of the blocks with green fabric. I couldn't fit much on my scanner, but this should give you a good idea of what the blocks look like. 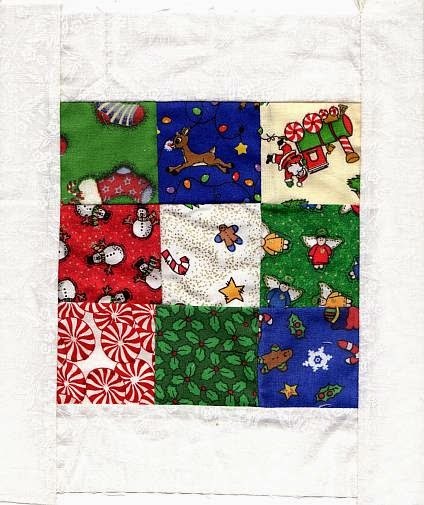 When I sewed the blocks together, I alternated the red and green. It was sunny yesterday and I took a photo of the nearly completed top, but forgot to save it to my flashdrive. Here's a virtual rendition of my quilt made in Electric Quilt. After squaring up my nine crooked 9-Patch blocks, I was amazed to find that three of the blocks actually measured 6.5 inches square! But the other six don't. So I'm using a technique called "framing" to make all nine blocks come out the same size. 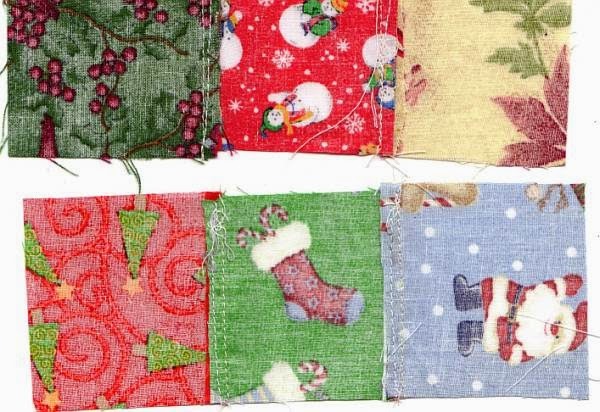 After looking over my stash of Christmas fabrics, I decided the prints were all too busy to work well to frame my 9-Patch blocks. I choose a basic white-on-white instead for this job. I want my uneven 6.5-inch blocks to come out as even 8.5-inch blocks, so I cut 2" strips of white fabric. This is wider than what I actually need, but it gives me some wiggle room when trimming the blocks to size. The white fabric doesn't show up well on the white page background, but I hope you can see that I sewed strips on the left and right sides of the 9-patch blocks. After pressing these strips over, I sewed strips on the remaining two sides of the blocks. 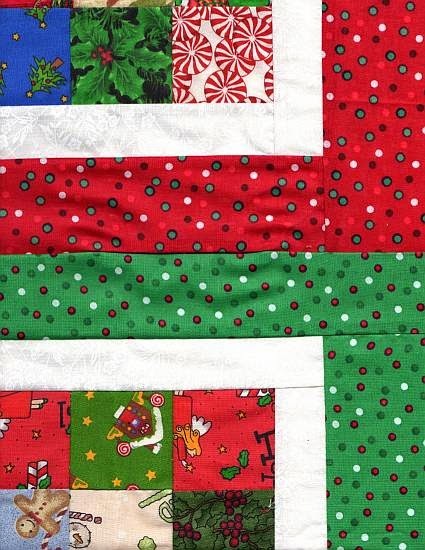 My next step is to trim all nine blocks to the same size, then decide whether to sash or not to sash. It's mid-April. My mom is settling into her new apartment, but half of her things are still here at the house. I can't move into the house until it's cleaned and some repairs are done, but I can't do those until Mom's things are dealt with. At the same time, I more or less have to be in the house because it's heated by a wood stove. In this cool, damp climate, if the house isn't heated it will deteriorate even faster. I tried working from my trailer and running over to the house every two hours to put wood in the stove, but that proved to be inefficient. Sooner or later (usually sooner), I'd get involved in something and totally forget about needing to feed the wood stove, then I'd have to spend an extra half an hour or more building another fire and getting the house warmed up again. So, I sort of halfway moved into the house. I brought enough kitchen supplies over here to prepare meals. I got a phone hooked up so that I have internet access on my old desktop computer. And I set up my old manual sewing machine on the kitchen table so that I can work on small projects when I get a few minutes here and there. It's not ideal, but it'll have to do for now. Last week, Mom gave me a small bag of fabric scraps she no longer wanted. 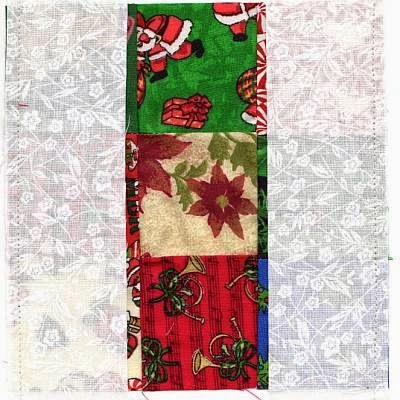 Amidst the scraps of children's prints, I found 25 strips of 2.5" squares of Christmas fabrics. Mom must have been working on 9-patch blocks but gave up on the project. After examining them, I could see why. She must have cut the squares with scissors, as few (if any) were cut exactly square. And although her seam allowances often started at 1/4th inch, they dwindled down to 1/8th inch or less by the time she reached the other side. Mom sews for the fun of it. She has never been that concerned about accuracy and for this reason has more success working with larger squares, like 5" or larger, where she has more room for fudging. Most of the seams don't match up, but a few do! They actually came out looking better than I first thought possible. As I was working on these, the nursery rhyme about the crooked man with the crooked little smile kept coming to mind, so I'm calling this project The Crooked Man's Christmas Quilt. Tomorrow, I plan to rummage through my stash to find an appropriate sashing fabric.